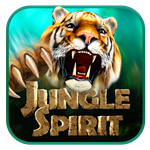 Developed by NetEnt, the new game Jungle Spirit: Call of the Wild offers you a great gaming experience, that features a Butterfly Boost features, free spins and a symbol expansion feature. Now you can have fun by experiencing your own deep jungle expedition through steamy valleys filled with tropical trees, flowers and fierce creatures. This is one jungle setting that presents you with amazing gameplay, enhance by the sounds wild animals including: crocodiles, elephants, cobras and more! Alongside them, you can find those other familiar symbols, made of aged stones and covered in mossy greens. +100 Free Spins. Play Now! Does Jungle Spirit have Lions, Tigers, and ummm- Bears? What kind of jungle is this anyway, as it would seem that NetEnt threw in all the kinds of wild animals to inhabit this very special kind of slot themed jungle. Actually bears aren’t native to most jungles with the exception of the Sloth Bear that can be found in the jungle forests of India. Nevertheless, Jungle Spirit: The Call of the Wild is a 5 reel slot game, with 3 reels with 5 icons on each line. It also offers you 243 different ways to win. Another cool feature are the free spin games where you need to choose between 5 animals, which allow different bonuses to be won. So, the option you select depends on whether your prefer to get a higher reward with less spins, or more spins with lower prize pay- the choice is truly yours. The five animal symbols are obviously the higher prize value, and are beautifully rendered, while lower values include high card symbols. You need to remember to set your bet amount before you start this adventure into the vast jungle. What do you mean- watch your step with Jungle Spirit? Even though this game doesn't have any wild symbols, you’ll need to pay attention to what steps are required when one of three bonus features are offered. You’ll also need to remember that each of the animal symbols in this game (except the scatter) can be randomly selected by butterflies, which fly around the reels and can expand 1 to 5 of them that are showing. These symbols are then expanded to fit the entire reel lengthwise increasing further wins. The free game count ranges from 4, 8, 12, 16 and 20 free spins respectively, which is where your choice in higher or lower stakes need careful considerations before entering that spin feature. The free spin games are only provided when the scatter symbol showing a pink flower is showing on at least 4 to 5 icons anywhere over the reels. Hunting with no risk involved? Demo coins here are easy to play and risk, so there isn’t a problem if you waste it all using max bet credit. However each line allows 1-5 coins with a minimum of one cent to one dollar per coin used. Moreover, in the base game you can win as much as 1,825 times your stake on each spin, while in free spins feature you can actually with 7,678 times your bet available on each free spin. By landing 4 or 5 scatters, it can award a prize of 15 and 50 times your bet respectively. If that wasn’t enough, the free spins can be played on 1024 paylines which change the 3x5 configuration to a whopping 4x5 reel set-up! As this is another great slot game from NetEnt slot game, you may choose which internet device to play it upon. This includes all the latest mobile smartphones and tablets. Even dust-off that old pc at home to get the full screen effect! Whether you choose to play for free, there is more excitement if you decide to play for real wagered bets. Jungle Spirit: The Call of the Wild is the one online slot that offers it all! This site is not accepting real money bets and payments. Please leave this website if online gambling is prohibited in your country or state.